Tonight the Phillies take on the Indians who are led by former Phils skipper Terry Francona. Francona is in his first year in Cleveland managing the team for whom his his father once played. Tito Francona spent 15 years in the Majors playing for 9 different Clubs. His longest tenure was with the Indians from 1959-1964 which included his best year in 1959 when he hit .363 with 20 Home Runs. Tito Francona spent a few months with the Phillies early in the 1967 season. He only collect 17 hits in 73 ABs and the Phillies shipped him off to the Braves. Terry Francona's Phillies connection is much more recent - his first career managing stint was in Philadelphia from 1997-2000 with the Phils. The teams results for those four seasons were mixed with the Phillies finishing between 3rd and 5th place. Terry, of course, went on to lead 2 World Championship squads in Boston. The above Tito Francona 1959 Topps Card is a common, off center, and severely bitten with a hole punch in the upper left corner - none of that matters as I found this baby in a dime box. 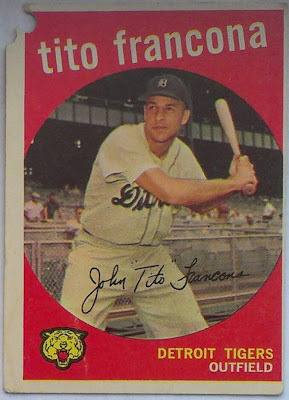 According to the Baseball Card Database Tito Francona's Rookie Card (as an Oriole) is in 1957 Topps. His Last Topps Card is in 1970. 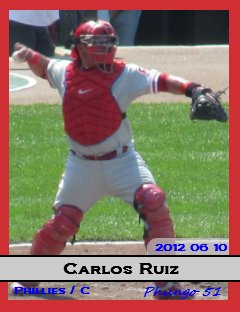 The Phils welcomed back Carlos Ruiz over the weekend, and I thought that was a good opportunity to put up his Phungo card from the 2013 set. Good Shot hear - sort of in action (its a warmup throw) on a Sunny Day in Baltimore. Regardless of his PED issues I am glad to see Ruiz back in the fold. Hall of Famer Luis Aparicio turns 79 today. He may have only had a career .262 average, but the 11 time all-star had plenty of other solid numbers. I have never been a fan of 1958 Topps, but I do enjoy the all-star subset. By definition all the players in the subset are stars with several being titans of the hobby. This card went $1 at the National in Baltimore this past August. This card as a good bit of surface wear (unfortunately a lot is across Aparicio's face) but you know what Folks a HoF card for a buckfrom 1958 that hasn't been chewed up by a dog is stealing. The Luis Aparicio Topps Rookie is from the 1956 Set #291. There have been several Aparicio RC auctions that ended under $10 recently for cards w/ marks and bad backs. The low for slightly better cards was $14 for one with soft corners but otherwise good. At least a dozen cards came in between there and $20. For a mere $649 you can take home a PSA 8.5 NM-MT+ version which was the high-end for the card. The card went as high as $95 unslabbed. Tonight the Tigers host the Braves on Sunday Night Baseball. Lets face it no sport is probably more parochial than baseball - If your team ain't playing, chances are your not watching. Typically I do try and check in with the Sunday Night game for an inning or two - I enjoy that the focus of the baseball world is on just two teams for a moment. This season I am going to try and run a series focused on the Sunday Night game - This will give me a chance to check out some teams other than the Phillies. I like the use of Jumbo or Super when discussing oversized Topps Cards. If you look up Topps Giant you get a bunch of Willie Mays McCovey and Tim Lincecum cards. The Bio information on the Freehan Base 1970 Topps #335 (click link then click photo to see flip) is composed over 2 lines on the Super rather than 3 on the base. 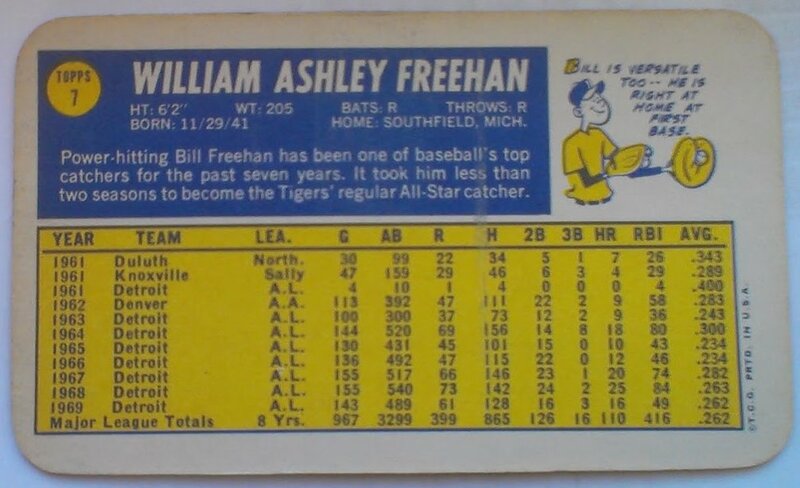 Bill Freehan was an eleven time all-star for the Tigers with whom he spent all 16 years of his career. His was the starting catcher for the 1968 World Championship squad that defeated Bob Gibson and the St Louis Cardinals in seven games. 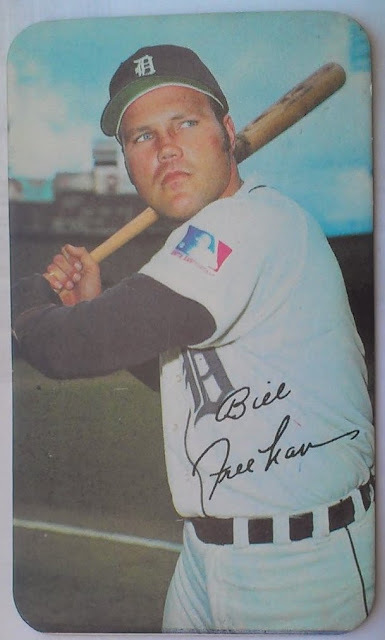 That was likely also Freehan's best season - he finished 2nd in the MVP voting to teammate Denny McLain (31 Wins). 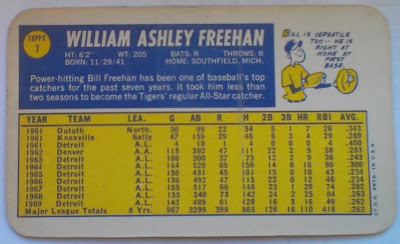 Freehan's numbers that year included 25 Homers and 84 RBI. For his career Freehan tallied 200 Home Runs and 1591 Hits. I am not sure if those are Hall of Fame Numbers but if a man was an all-star 11 times at catcher he had to be solid. I picked up the above Bill Freehan card for a dollar at the Granite Run Mall show this past weekend. 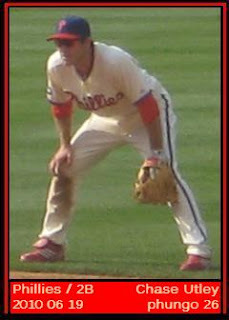 Why would Chase Utley STAY in Philadelphia? This spring Chase Utley was coming off of two injuring riddled seasons. A large question lingering for the Philadelphia Phillies was whether or not they should re-sign the all-star second baseman who is set to be a free agent at the end of the season. To me that has all changed. Utley is off to a good start, the Phillies not so much. Chase Utley is batting .309 with 4 Homers and 16 RBI with an OPS+ 144 during the early part of 2013. This project to just a tick under his best career years. True he has been worthless v LHP (.200 BA/ .273 OBP/.450 SLG) to the point where he bunted to get on TWICE during the Pirates series, but the overall number still stand up. This brings up the question with Chase Utley getting this kind of production and the Phillies treading water in neutral at best. Why would Chase Utley want to remain with the Philliies? The Spring Traing Q has been reversed. The Phils keep saying they want to get younger but they don't. Even with Utley and Ryan Howard in the lineup they are plaqued by the same issues they had in 2012 - General lack of scoring and scoring Opps and bad 7th & 8th inning relief. A player of Chase Utley's caliber and age (34) may not want to stick around for the Phillies youth movement and I see him both A) getting traded and B) becoming a free ageint. Buster Olney mentioned both the Orioles and Royals as landing spots recently. I would love to see him play for the O's as they are the Team Phungo AL home team. I really can't stand to see him go but that would soften the blow. There are a lot of bigger names at this weekend Poppel Show at the Granite Run Mall, but none of those guys are Phillies Alums. Phil Linz played two unremarkable seasons for the Phillies in the middle 60s. His Phillies tenure like much of his career was spent primarily as a utility infielder and pinch hitter and runner. Phil Linz Wiki Bio does contain some reference to both "Ball Four" and "The Great American Baseball Card Flipping, Trading and Bubble Gum Book"
More information on the show can be found at Poppel.com. I have Red Schoendienst's 1974 Topps manager card from when I was a kid. Anytime I looked at that card all I thought was "Man that dude is old" - and truth be told I was sort of right - he was 50+ at the time. Back then the only people I knew that were older than that were my grandparents. Now half the people I know are approaching 50 and some have already passed the number. Red Shoendienst was selected for the Hall of Fame by the Veterans committee in 1989. He had been on the BBWAA ballot a full 15 times concluding with a 39% vote in 1983. Schoendienst topped out at 42% in 1980. Red's HoF credentials appear pretty mediocre. Most noteworthy number is probably his 10 all-star teams. He did amass 2449 hits and scored 1223 runs. Among his best seasons was 1953 when Schoendienst finished 4th in the MVP voting when he batted .342 with 15 home runs. The 1953 NL MVP voting has to be one of the best ever - The top 6 finishers are all in the Hall, Campanella, Ed Mathews, Duke Snider, Schoendiesnt, Spahn, and Robin Roberts - on top of those heavys there was also Stan Musial who finished 8th. Schoendienst was also a member of two World Championship teams, Cardinals in 1946 and the Milwaukee Braves in 1957. Schoendiesnt was only a year removed from playing when he became the Cardinals manager in 1965 - The Cards won the World Series in 1967 followed by an NL pennant in '68. He remained manager through 1976. I think Red Schoendienst became a Hall of Famer on his cross discipline record. He had success as both a player and manager. Similar circumstances should lead to Joe Torre's induction in the near future. In 1990 At the age of 67 Schoendienst returned to manage the Cardinals for 24 games - He has to be one of the few men to manage in 4 different decades. Found the above card in a $2 bin. Any HoF card from the 50s is worth $2 no matter how marginal the candidate. Lo-Bay auction for this card concluded at $1.83. Four auctions finished under $5. The High end was $228 for a PSA 8.5 NM-MT. 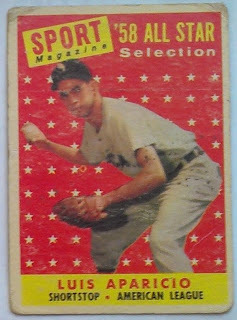 Schoendiesnt's common Rookie Card is 1948 Bowman #38. Low recent auction concluded at $54. A PSA 5 Excellent card went for $151. The card peaked at $203 (PSA 4 VG-EX). go figure. 1991 Topps Stadium Club #195 Omar Vizquel - Future HoF? For the first time in my life everybody single player on an Opening Day roster was younger then me. The last man to take the field that was older than myself was gold glove shortstop Omar Vizquel. Vizquel and Phungo favorite Jamie Moyer were the last two guys to play that were older my present 45. Omar Vizquel turns 46 today. It is an odd milestone, and really only meaningful to myself. Regardless I did note its passing with a pang of sadness. 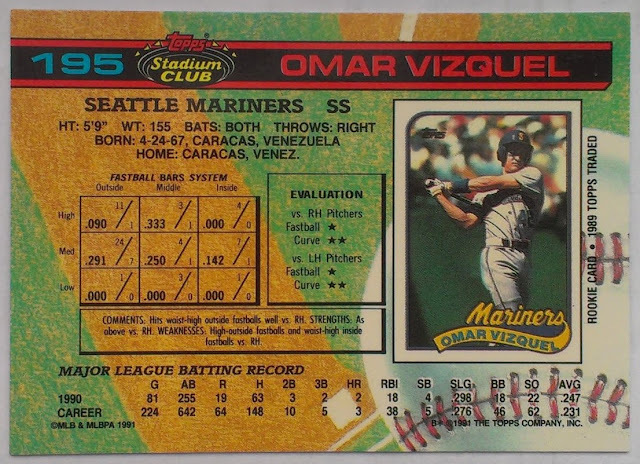 Omar Vizquel came up with the Mariners in the late 80s and was traded to Cleveland following the 1993 season to make room for some big prospect that would turn out to be a steroid gobbling oddball. In Cleveland Vizquel made 3 all-star teams and was the starting Shortstop for five consecutive playoff teams, The Best of which were the 97 Indians who took the Marlins to extra innings in game 7 of a very memorable World Series. For his career Vizquel appeared in 57 Postseason games. His postseason numbers include 23 Stolen Bases in 26 attempts. Vizquel is a borderline Hall of Famer - He would get my vote. The four decade mans big stats are largely accumulaters but he did it as a good glove man at a premium position. His career BA of .272 may not be impressive but he did rack up 2877 Hits. There are only 3 HoF eligible players above Vizquel in Hits that are not in the Hall (Bonds, Rafael Palmiero, and Biggio). The only Shortstops ahead of Vizquel are Jeter and Honus Wagner. This is an early Omar Vizquel card. I like how Topps posted the players RC on the flip of Stadium Club Cards. It was one way that Topps could take advantage of their history in the Hobby. 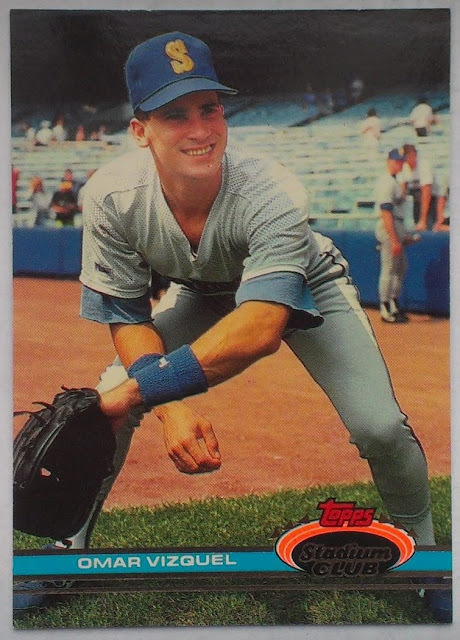 If Vizquel does get into the Hall, I think his Rookie card will still be found at reasonable prices as 1989 Topps are pretty ubiquitous. Not sure that this is also true for the traded set, but it looks like you can pick up the complete 132 card set for under $15 and it includes the Topps RC of both Ken Griffey Jr and Randy Johnson. This year marks the 30th anniversary of the 1983 Phillies Wheeze Kids team that won the NL Pennant and faced the Baltimore Orioles in the World Series. Throughout the season I plan on taking a look back at some of the members of this special team. John Denny was a good pitcher that had one great season which occurred in 1983. Denny went 19-6 for the year with a 2.37 ERA and won the Cy Young Award. It was a significant spike in a 13 year career and the only time that John Denny ever received a Cy Young vote. His 1983 WAR of 7.6 also led the league for all players, not just pitchers. It was also the only season Denny reached the post season. He got the W in the game 1 of the World Series, giving up only 1 run over 7 2/3 inning. Unfortunately it was the only game the Phillies were able to take in the series. 1983 was John Denny's first full season with the Phillies. He stayed through 1985 compiling a 37-29 record with the team. He retired following the 1986 season which he spent with the Reds. 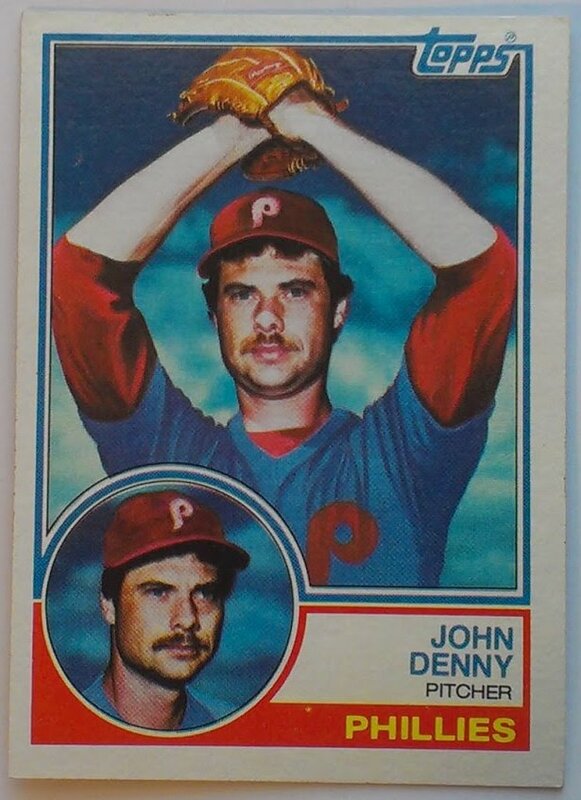 The 1983 Topps John Denny Card recently made the Top Ten Terrible Airbrush Jobs over at Hall of Very Good. Bill Mazeroski is the Hall of Fame Shortstop who spent his entire 17 year career with the Pittsburgh Pirates. He is best known for hitting the game winning Home Run in game 7 of the 1960 World Series to finish the Pirates dramatic upset of the mighty New York Yankees. The Yankees outscored the Pirates 55-27 in the 1960 series but lost basically because the Bucos took all the tight games while all three of of the Yankees wins were by lopsided scores of 16-3, 12-0, and 10-0. The Yankees averaged just under eight runs a game for the series and Lost! Mazeroski's career .260 batting average makes him one of the more debated Hall of Famers. In his 1990 book "Men at Work" George Will dedicates a fair amount of time supporting Mazeroski spot in the Hall based on his defensive prowess. Spending an entire career with one team as Mazeroski did is typically a bonus. Bill Mazeroski has spent a lot of his post career time with the Pirates as well filling in the Ambassador role for a club that has struggled on the field for the past two decades. In 2001, Eleven years after the publication of "Men at Work" Mazeroski was elected into the Hall of Fame by the Veterans Commitee. It was a controversial election and which has led to modifcations to the Vet Comittee voting process. When I returned to collecting this BIll Mazeroski Card was one of my first ebay picks. This card was part of a small lot of Vintage HoF cards I picked up on via auction. It is in real decent condition was a steal at $3.50. Recent sales have concluded as low as $7.45. 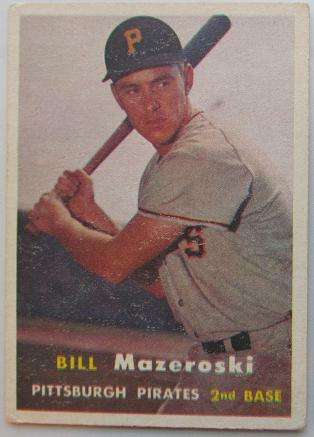 At least 4 recent auctions of a 1957 Mazeroski finished under $12. A PSA 5 (Excellent) card went for $30. The card topped at $322 for PSA graded 8 (NM-MT). 1961 Topps #312 1960 World Series Game #7 Mazeroski's Homer Wins It! Another fine Bill Mazeroski card is the above 1961 Topps Card celebrating Mazeroski's famous Home Run. This card was purchased for a dollar at a show in 2009. Probably should dedicate a proper posting to this card alone at some point in the future. Tonight Jonathan Petttibone makes his major league debut with the Philadelphia Phillies. One of the happiest folks today win or lose will likely be Jay Pettibone. 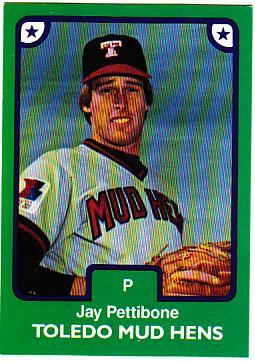 Jay Pettibone made 4 starts for the Minnesota Twins during a September call up in 1983. That is the the extent of his Major League career. Pettibone's best start was probably his major league debut - He threw a Complete Game versus the Kansas City Royals. Pettibone entered the 9th inning having only given up 3 hits and 1 run - However the Twins had also only scored a single run. Pettibone retired the first two batters in the 9th before giving up a single to Hal McRae followed by a Willie Mays Aikens dinger. That was all the Royals needed - Dan Quisenberry came in and pitched a scoreless 9th and Pettitbone took the loss. Jay Pettitbone got 3 more starts for the Twins and took the L in all 3 starts. He ended his career with an 0-4 record in 4 career starts - the highlight was probably that first start v the Royals. Hopefully Jonathan Pettibone has a longer career then his father - regardless I hope both men have a good night this eveiing. Team Phungo's first game of 2013 was pretty miserable. The night featured brisk cold, gusty winds, and Zero offense from the home squad. Despite the crummy game and weather we had a decent night and did get a couple of pix worth noting. The flags were at Hall-Staff as a memorial and tribute to the victims and heroes involved in the Boston Bombings. The star of the game was Cardinals 25 year old pitcher Lance Lynn who tossed 7 innings of 1 hit ball. This is a photo of Lynn tossing a warmup pitch late in the game. The lone hit was a leadoff double by John Mayberry Jr on a 3-2 pitch leading off the 5th. Cliff Lee pitched poorly - He only got in trouble in only one inning, the 3rd, when he walked the bases loaded in front of three consecutive singles, but that was enough. He was never on the whole night, He went 2-0 on the first two batters of the game and went ball 1 for all four batters he faced in the first. His fastball was high frequently throughout the evening. The Phillies new third base coach Ryne Sandberg chats with friends and fans pregame. With each passing game Sandberg looks like the next manager of the Philadelphia Phillies. Two years in the Phillies starting lineup cards still feature 2011 Topps. 2011 was, of course, the last time the Phillies made the post season where they were eliminated by this weekends opponent, the St Louis Cardinals. This season the Phillies also feature these Scoreboard Bios that have a Baseball Card Motif. The design echoes 2003 Topps. I imagine the Phillies will be featured as a lot of bad guys in the Jackie Robinson biopic 42. One of the Phillies pitchers from the era that is featured in the film is Dutch Leonard. 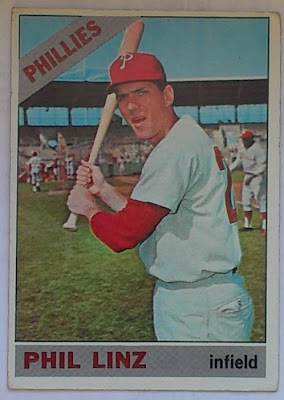 Dutch Leonard only played two seasons for the Phils but that was good enough to get him on two Bowman cards (1948-49). Also of note, Dutch Leonard tied for the NL lead in saves in 1935 with 8 EIGHT! - doubt it was a stat at the time. Dutch Leonard is played by another Major Leaguer in 42, CJ Nitkowski. Once again Hollywood has taken some liberties with history - and the issue can be spotted on these two cards. Dutch was a right-hander, whlle CJ is a southpaw. CJ Nitkowski is also a columnist and penned an interesting article about his own experiences with racism while pitching in Japan. Nitkowski is active on Twitter @CJNitkowski and also has his own blog. Finally to tie all this together the Phils are facing Reds tonight in a desperate attempt to salvage a game in this series and a 3-3 road trip. 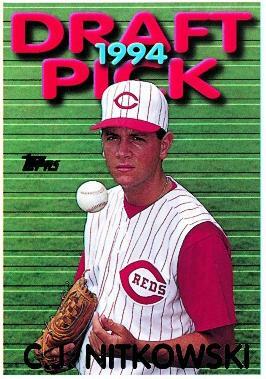 Nitkowski was drafted by the Reds 19 years ago. 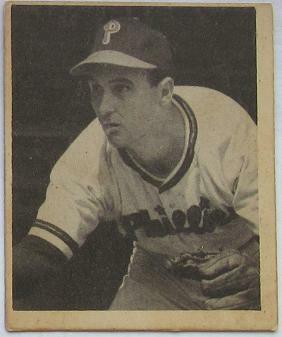 The Dutch Leonard card is one of two Phillies represented in 1948 Bowman. I always tell Phils fans that want to build a vintage team set that is the one to pick - interestingly the other Phillies player in that set is another Emil, Emil Verban. Off condition 1948 Bowman commons from the low series can be had for about $2. The Phillies are in Cincinnati to face the Reds this week and today I would like to take a look at Hall of Famer Tony Perez. Perez was a member of the Big Red Machine teams of the 1970s as well as the Phillies Wheeze Kids squad. The "Wheeze Kids" were the 1983 Philadelphia Phillies - the monicker was a play on "The Whiz Kids" who were the much younger 1950 Phillies. Despite the differences in player ages the two teams had some things in common, most notably representing the National League in the World Series. Perez's Hall of Fame resume includes 2 World Championships(75-76) with the Reds. In addition to those World Series squads and the Phils 83 team Perez was also a member of 2 other Reds NLCS teams. Tony Perez made a total of 6 trips to the postseason - amassing 189 Plate appearance which is pretty good for the era. He has 6 post season Home Runs including 3 in the 1975 World Series v Boston. His regular seaon career numbers include 379 Home Runs, 1652 RBIs and 2732 Hits. Tony Perez was born in Cuba and was signed by the Reds in 1960. Apparently he was able to get out of the country prior to the aftermath of the Cuban Revolution and severing of ties with the US. Perez has been allowed to return to Cuba a couple of times, His son Eduardo played for the Reds and has been a commentator for ESPN. This card has some new information to me. To me Perez was always a first baseman. The Reds Thirdbaseman of the 1970s was always Pete Rose. This of course is not true if you go back a few years. In the early 70s Perez was the 3B and Rose was playing Right Field - one of many positions the gambler would play. I picked up the 1970 Perez card above in March of 2010 from a 3 for a buck bin. 1970 Topps is one of my least favorite of the vintage sets, but I would still got a $1 on any HoF even a lower tier one like Tony Perez. I Haven't seen 42 yet but I have seen the ads as well as the trailer and some promotional interviews. Ralph Branca has been featured in the interviews and appears to have a prominent role in the film. Ralph Branca is one of the Brooklyn Dodgers that befriended Jackie Robinson rather than shunning the new player. According to wikipedia Branca stood with Jackie Robinson for Opening Day lineups in 1947, when other Dodgers refused. Nothing quite like being on the right side of history. Branca is also known for giving up "The Shot Heard Round the World" to Bobby Thomson in 1951. The Home Run by Thomson completed a victory for the Giants in a 3 game series to determine the NL champ. The three time all-stars career was much bigger than that single game. He pitched for a dozen years almost entirely with the Dodgers - He pitched in two World Series (1947, 1949). Jackie Robinson's first season (1947) was Branca's best as he posted a 21-12 record with 4 shutouts and loggged 280 innings. The 21 Ws and his 147 Ks were both good enough for 2nd in the league while his 2.67 ERA was 3rd. Ralph Branca is still alive at age 87 and can be seen promoting the film 42 on several baseball and sports outlets. There is also an official Ralph Branca website for fan who are interested in autographs and other memorabilia. I picked up the above Branca card for $1 at a show last April. The card may be a little rough, but any vintage Brooklyn Dodger card for a buck is like stealing. The Lo E-Bay for a really rough 51 Bowman Branca among recent closes is $3.78, for $4.04 you could get a much nicer card. The card peaks at $69 for a PSA 7 NM. 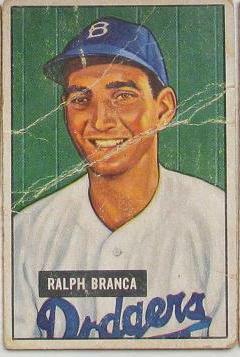 The only Topps card for Ralph Branca is from the iconic 1952 set #274. The low recent auction for an acceptable condition card was $11.94. A PSA 8 NM-MT went for a tidy $414. If your willing to settle for PSA 5 EX you can get the card at the far lower price of $95. It should be noted that the card is part of the middle series of 1952 Topps which runs #251-310. I have found commons in this series run 2-3x higher then the low series, stars and HoF vary but typically multiply more. TAXES!!! - ticket Tax that is or "Convenience Fee"? Ok Convenience Fees and Order Charges are not Taxes, but they feel like Taxes. This is easily noticed when you pick up tix from your favorite team, the prices never seem to be what they was originally advertised. I did a little research to find out what these hidden fees amount to and how they can affect the consumer. Here is what I found. I took a look at The Phillies and their brethren NL East as well as Yankees and Orioles largely because they are within reasonable commuting distance. I also included some local minor league teams. For each team I looked into the cheapest ticket, an Upper level behind the plate ticket and a pricy lower level ticket. All games are for weeknights - generally the teams next home game on a school night. I don't think anything here will shock fans. The ticket fees are generally the same regardless of the base cost of the ticket. If there is one thing that is surprising it is how much extra one pays on a convenience fees for a "budget:" ticket vs swanky seats behind the dugouts. The Phillies have $7 in ticket fees on a $17 SRO tix. That bumps up the cost of the original ticket by 41% to a cost of $24. If you have the funds to purchase two tix in the lower level your fees on a pair of $70 tix are $14.50. The hidden fee pct is only 10%. So yes in this case the 1% due fair better than us schlubs that are just happy to get into a game. The Orioles had the most egregious markup - there $9 upper level tickets actually cost close to $15 on line. The hidden fees amount to 64% of the original price. Just for fun I looked into some Yankees Legends seats. The ticket fees themselves were $39.40!!!! Of course those cost $1400 for a pair, therefore the ticket fees are only 3%. There are some other ticket fees that varied on how you wanted the tix delivered. The Braves were the first team that had an upcharge for Will-Call tix. The Yankees had several different ticket delivery options and prices. It is interesting to note that the Yankees offer a $6 ticket on Tuesday Nights if your a Mastercard holder. I should also note that these ticket fees can likely be saved by purchasing tickets at the stadium, although this may not be possible day of the game if there is the prospect of a sellout. I honestly don't mind the hidden fees, but I wish the teams would be more up front about the fees. Rather than nickel and diming a fan like an airline I would prefer they just tell me the tix price up front. Stubhub has moved to this format - right away you know what your spending as opposed to navigating through several screens to find out your $15 tix is really going to be $25.